I just got back from a trip to the new warehouse. They are really moving along. The 2nd floor trusses are almost finished and they can start laying some flooring hopefully tomorrow. I hope you enjoy this little video tour. I'll take a better one in a couple of days... I'm just learning this new camera. It sure is getting exciting how fast the work is going. Pretty soon, we will be in there building our shelving and moving just after Christmas! Hooray!!! 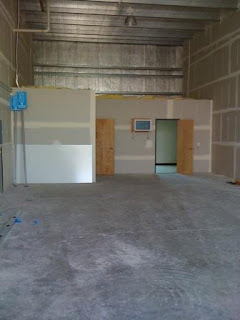 Finally, construction has started on our 2nd floor in the new warehouse. I went there Saturday to drop off a few things, and lo and behold, there were workers there! They were chalking out where the studs were going and they cut the hole between the 2 units. Then, last night I went to meet with the electrician to figure out our lighting and where all the outlets need to go. The carpenters were there again, but this time part of the new walls were framed in. In this picture, you can see the studs for the inner walls. These walls have to be put in so the joists for the upper floor can rest on them . That shows you where the ceiling heigth will be. 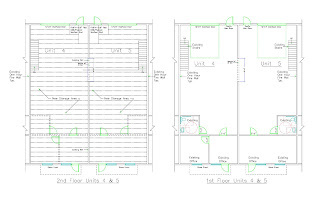 The joists will be 24" high, so the new floor will be at the same heigth as you see at the top of the bathroom. 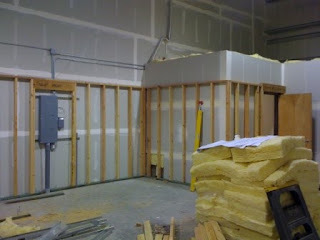 The little corner pictured above will be our "break room" with a sink, cabinets and a little fridge, etc. The joists should be here on Friday (crossing our fingers) and they said it would take them "no time at all" to get them in. We'll see about that!!! Yesterday, I ordered all the shelving we will need. That was a major chunk of cash!! Whew!! But it will be so nice to have ROOM to put everything!! I'm so happy things are progressing along so well. I'll go back over there later this week and take some more pictures. 1 small step towards moving. Yesterday, we had the electricity turned on. The plans to build the 2nd floor have been approved by the county, so now we are just waiting for them to actually print the permits. Construction should start next week. If all goes well, we should be moving the whole month of December (mostly shelving and overstock products + getting bins and things organized), with the actual BIG move after Christmas. At least that is the timeline in my head. We went by the new digs this morning to drop off a desk. Wish I had remembered to take a picture... but they have our classroom area almost finished. The wall still needs painting where the patch was done. Our "classroom" area will be used for holding local sales (for insurance reasons, we can't have people actually shop in the warehouse), and hopefully some day actually have card classes or small crops. Looks like we would be able to fit 10-12 people in there.... I'll know better once we can put some tables/chairs in the room. We have some very exciting news to share! Our warehouse will be moving to a 6,000 s.f. brand new building very soon. 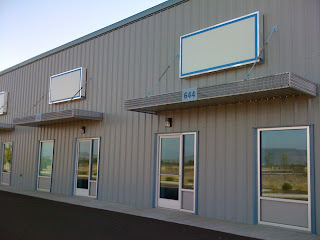 We just put a down payment on a warehouse space just 8 minutes from our current location. The space is currently empty, and part of a larger warehouse building. We are purchasing 3,000 s.f. and adding a 2nd floor to give us 6,000 s.f. of space. This will almost double our current space. This is the inside of 1 of the units. You can see where the 2nd floor will go up, as well as the wall separating the 2 units. There will be a BIG archway between the 2 units both upstairs and downstairs, creating 1 large space for us. It's kind of hard to see... but the left one is the upstairs which will be 1 big expanse, and the right one is the downstairs showing 2 offices and a larger room at the front of the building, plus the big warehouse at the back. You can see the staircases on either side towards the back too. Now I need to map out how all the shelves will be arranged, as well as the freight receiving area and the shipping area. If all goes well, we should be moving in around the middle of January. It's going to be a LOT of work!!!! But we are looking forward to our new digs. We’re gearing up for the CHA Summer ’09 new releases. Since we like to be on the ball bringing you the newest products, we’ve already placed about ½ our CHA orders AHEAD of the show!! That’s right, we hound vendors and work hard this time of year. So what’s in store? Read on! Our BBP order is in and expected to arrive towards the end of the month! Wonderful lines to watch for include: Delilah, Kitchen Spice, Gypsy, Flutter Butter, Boo Crew, Tis the Season and St. Nick. Watch the new products page for these soon! I ordered their new lines of papers and embellishments a couple weeks ago, and already I can’t recall all the particulars…. I know there are 3 or 4 lines of papers and a WHOLE NEW program of brads, glitter brads, pearl brads, etc that was really great!! I love embellishments, don’t you? Of course, new thickers are coming too, and also some clear stamps!! Watch for these to be uploaded to the website late next week. We just got in the 4 seasonal squeeze punches for all. You can see them at http://www.franticstamper.com/fiskars.htm Four fun designs including an acorn, a pumpkin and more. Other new punches will be coming out later this summer. Mumm is the word…. As in I can’t say what is coming….. all I can say is we ordered everything twice over and some things even more! It’s all gorgeous. Four fantastic lines. I definitely have my favorite, but if I told you…. well, let’s just say I can’t tell you until CHA. But OMG you are going to love love love these!! Stay tuned. Speaking of embossing folders, we took the plunge and have ordered Sizzix’s version of the embossing folders (Textured something… I can’t remember the term). Anyways, we ordered all the existing ones (which will be here shortly) and all the new ones (coming out later this summer). I will upload these in the next couple of weeks. Remember, lots going on, so my time is filled up with filling orders…… I need to hire a full time web person to keep up!!! You are going to FLIP at all the fantastic new designs, especially the ultra cute Halloween and Christmas ones. They are coming out with a TON of $1.99 price point stamp, many are favorites from larger sets, so you won’t have to spend $9.99 to get the one image you like off a set. We expect them to arrive late August. Great new line of punches…. Some fantastic punch/emboss combos. I think we will have these in early August. Another great line of punches, much like their Winter CHA release --- multi shape punches. My favorite is a Fleur de lis one, and I also really like the Ice Cream Cone and the snowman. I’ll try to get these on the site this weekend so you can start pre-ordering. We used to carry their stamps…… and then we stopped…. And now we are starting again. Why? Well, I wasn’t paying attention. Their new stamps are the coolest thing!!! You get a wood mount with grooves, and rubber with grooved back. You can interchange words and images to make these fantastic medallions. Oh, just wait til you see them!!! Since we have no space in the warehouse, I know my employees are going to think I’m crazy cuz I just don’t know where we will find the space to stock them…. but they were so darn cute, I had to get them! You will love them too! The best part is you can use the scallped circle punches from Marvy or EK Success or even your Spellbinder nestabilities to create these fun medallions! I love this look! New colors of Glimmer Mist for Fall and Winter of course…. New Glimmer Screens and clear stamps as well. Already ordered, already on the way. Watch for them soon. That’s all the orderes I have already placed…. But this weekend, I will be working on October Afternoon and Cosmo Cricket for a start. CHA is just around the corner and we will be closed July 19th through 23rd. Right now, we have a lot of orders on the books, so I hope to get them all done before we leave. It’s good to be busy! I've just been gently reminded (again) that I've not blogged since August 2008!! Shame on me! Shame shame shame. Many of you know I work long long hours filling orders, adding products to the website, not to mention all the back office stuff (ordering, bookkeeping) and the list goes on. Let's not forget having a personal life and perhaps some house cleaning once in a while (hmmm... scratch that, I never have time for that.... my dear dear husband takes care of everything). But I must make an effort. So today, I dug around in my files and found several lovely pictures sent in by a wonderful customer in France. Take a look. Mizuhiki is a Japanese paper cord which comes in brilliant colors and can be fashioned into many shapes. Creations like these take some practice for sure, but there are also many simple things you can do.